I come to you all, once again, to ask for help with a cause I hold close to my heart. My son was born in November of 2006, and Oakland Children's Hospital saved his life. He was in their NICU at 3 days old and spent 10 days there. The fear was unimaginable, unless you've been there yourself. What got me through, was the support from people that didn't even know us. Cards from local kids etc. It somehow gave me strength. This is my effort to repay the emotional debt I owe the hospital, and God, for saving my son. Every year, since 2007, I've been bringing our donation to the hospital the week after Thanksgiving. The hospital has Santa give out the first items on Christmas Day and the remainder are saved and distributed by the nurses or chaplain. Some are used to wrap a baby as they pass away in their parents arms. However, most babies are saved. The afghans are given to the babies that survive as well... or, if needed to a frightened sibling. In our 9 deliveries thus far, we've brought a total of 1,357 afghans! The NICU cares for aproximately 400 children a year. 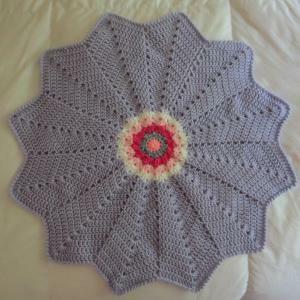 I'd love to be able to bring a donation so that every child for a year gets an afghan. I'm asking for donations of anything handmade... crochet, knit, sewn, crocheted edged fleece, etc. The NICU cares for babies of all sizes. From micro-preemie (think chunky Barbie doll sized) to a one year old baby. In our time there, most babies were full term - obviously with many preemies as well. 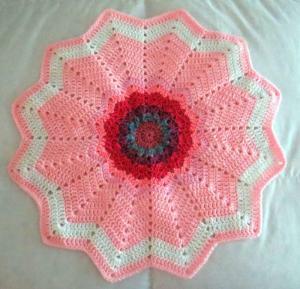 Afghans can be in any size you feel like making. The smaller the size baby, the likelihood of more monitors and tubes, so less holes in those are best and more lightweight. Babies are up to a year old, so full size afghans work as well and any size in between. Also, ghans used to wrap a preemie who is passing away would need to be larger in order to wrap around them. You can also send me hats, booties, scratch mitts, jackets, burial gowns. Anything you can think of will find a baby who needs it and a family who will never forget your kindness. if you feel moved to make something for an older child, I can take that as well. The hospital cares for children up to 18 years of age. My mother makes hats for older kids and we take that at the same time as the NICU delivery. Thank you for thinking of helping the babies. I can assure you that the parents of the children who receive a donation will never forget you. You can send me items at any time. I have two huge rubbermaid containers that I store them in, in a closed shed. They are well protected. If you are able to wash items before mailing, that is helpful. Especially if you smoke or have pets. Kathryn, let me be the first to congratulate you on your upcoming 10th year of this wonderful charity drive. I will be getting my crochet hook going in the new year to make some little blankies again for your NICU babies for Christmas 2016. You can count on a few from me. I plan to contribute a couple more this year!! Kathryn, I've gotten away from crocheting lately and want to jump back in. I was thinking I would make a few more of those baby jackets. i hope that was something they could use at the hospital. Thank you Jeanne! Those were lovely! Kathryn, I started a few hats and one blanket, but thought I should check with you. 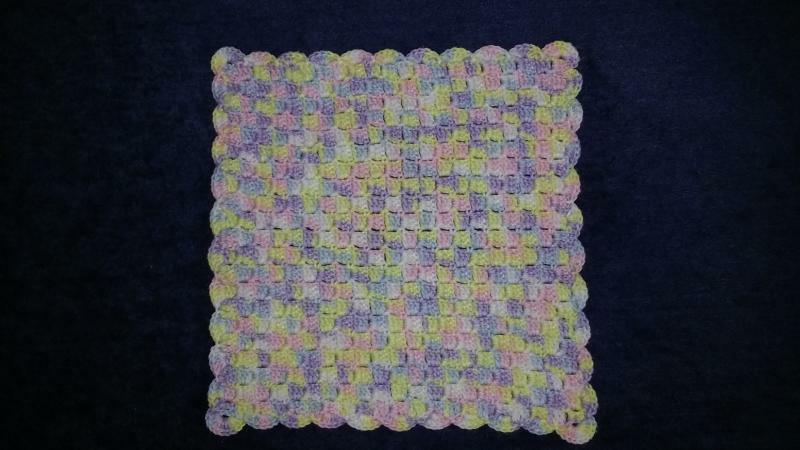 The blanket is basically a larger size granny square. I'm wondering about the holes in it. I don't think it's suitable for a preemie or newborn. 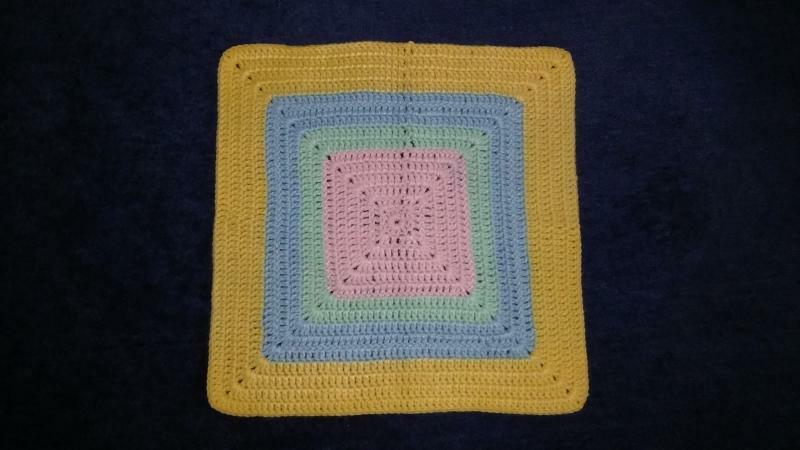 If I make it larger, do you think a one-year old child or a toddler could use it? Can't believe it's been 10 years already!!! I'm in again this year! I haven't been on the ville in a while - and honestly haven't picked up my hook in a while. I lost my father almost a year ago and I'm still navigating my way through grief. However, I will be getting afghans done for the hospital and wanted to check in and let you all know how glad I am for your help. I don't seem to get emails to posts I follow, but I'll be checking in. I am so sorry about the loss of your father. Taking care of things and getting through all the "firsts" without him is hard----I lost mine 9 months ago. PM me your mailing address when you get a chance. 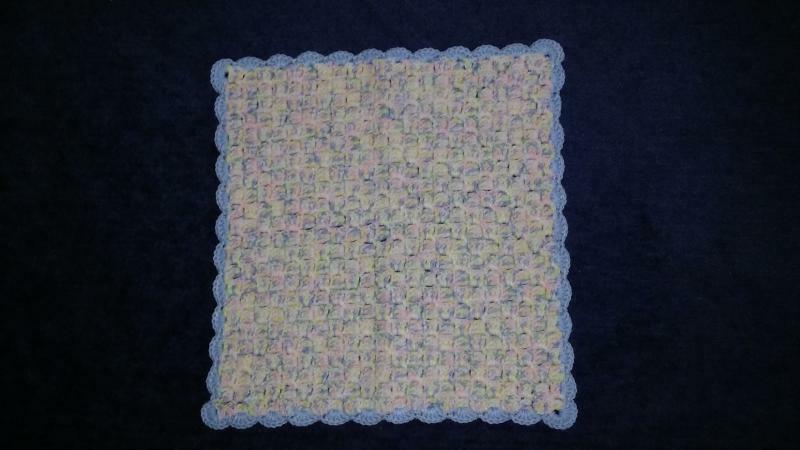 I have some little afghans to send. Kathryn - Thank you so much for staying with this charity drive even in light of the grief you have been enduring this last year. We all support you and love this charity. 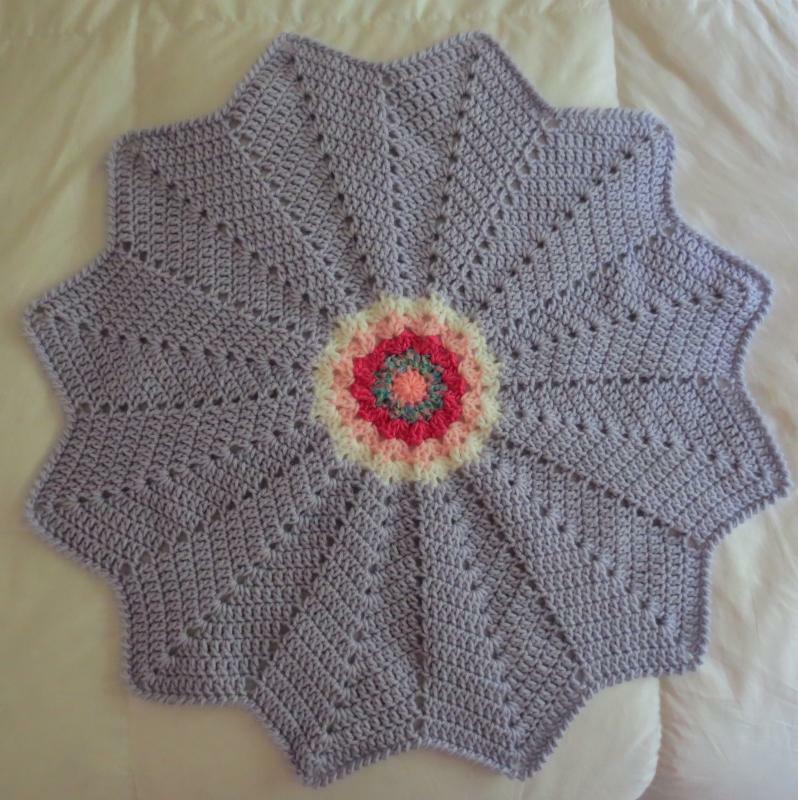 I am picking up my crochet hook right now and am starting a round ripple for this year's drive. 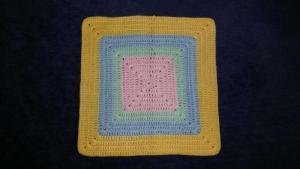 I challenge everyone out there in Crochetville land and beyond to do the same. Let's get this blanket drive going and encourage each other. I'm in and i will do what i can! Wonderful and thank you for your support! I am about half done with the one I started Thursday. 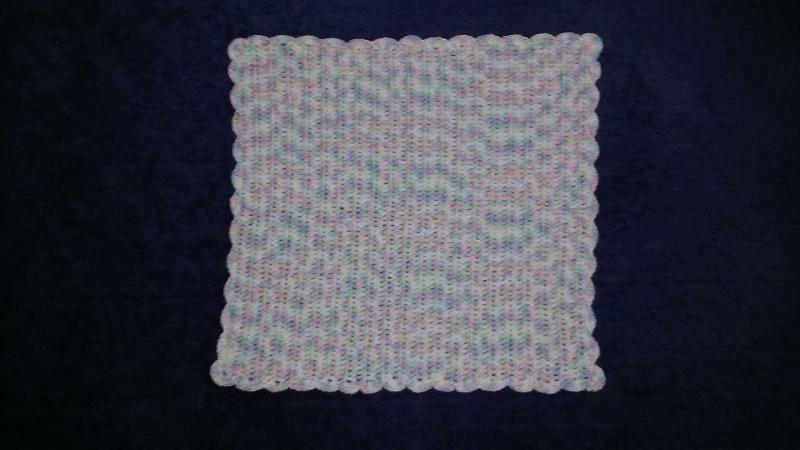 Here is the promised new round ripple baby blanket. It is 24 inches wide and I used up several scraps of yarn for the center and then a pink super saver skein for the main part. 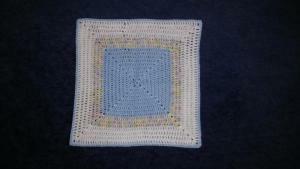 I already start another one and hope to have it done soon so I can ship 2 completed blankets off to Kathryn. I have a question. 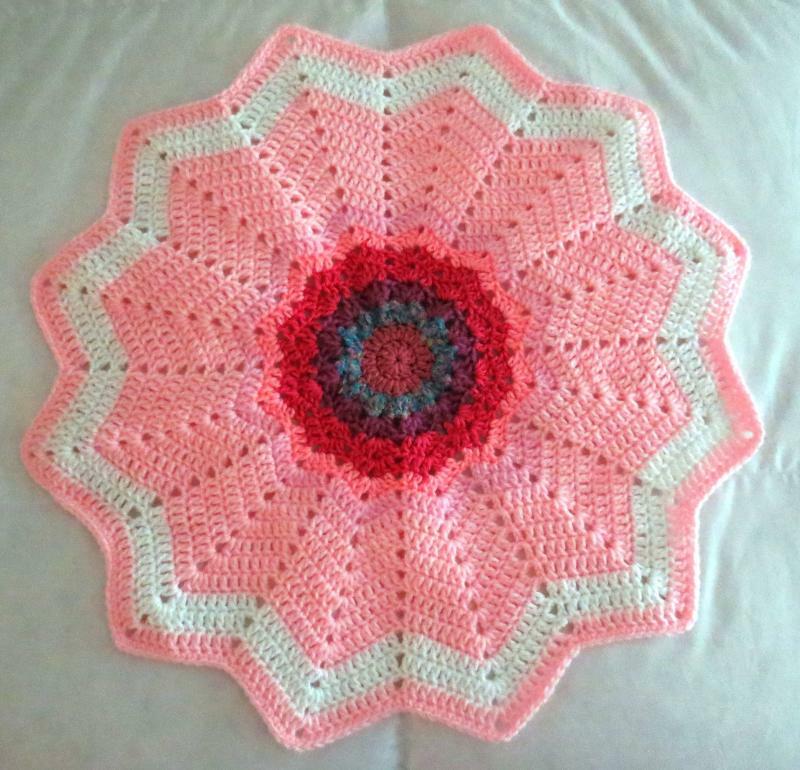 I have patterns for baby doll blankets. The size is 9" x 12" is that to small? Should I make 4 of the same kind and make one blanket out of them? I know when I made the hats and booties last year, TampaGuy asked if I was making them for babies or dolls? 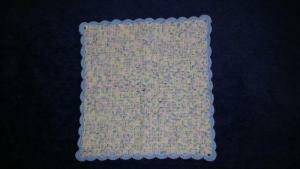 The blankets use baby or sport yarn and an F hook. I am not good on the sizes for this either. 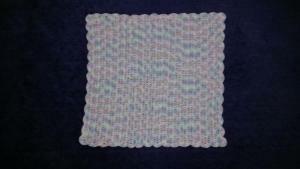 I have seen some that a group was sewing and they were the size of wash cloths. I am shooting for 14 inches X 14 inches as the smallest and hoping thats okay. Others are larger as it depends on how much yarn there is of that type. I am working up yarn I inherited from my aunt. I know that Kathyrn takes smaller blankets for the preemie babies but am not sure how smaller they can be. I sent Kathryn a PM asking about this. As far as the colors and kinds, you can do whatever you'd like. I know I've done lots of different patterns and styles so just do what strikes your fancy for the blankets. I finished up my 2nd round ripple for this year's blanket drive. 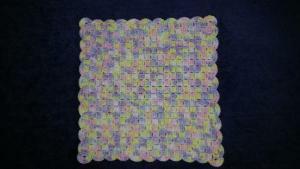 Here is a purple RR mainly using a Caron lilac yarn pounder. The center was scraps I used up and then finished with the pounder. It is 26 inches wide. I have my two round ripple all packaged up and will be shipping them off tomorrow to Kathryn.